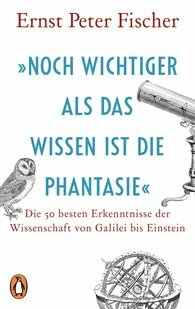 "Even More Important than Knowledge is the Imagination"
In his latest book the distinguished science historian Ernst Peter Fischer has collected the best scientific insights from the past. Be they by Galileo Galilei, Marie Curie or Albert Einstein – they are words of wisdom whetting our appetite for knowledge and inspiring us to learn more about the researchers and scholars who make it easier for us to understand science. As entertaining and profound as ever, Ernst Peter Fischer shares with us his fascination for this world and encourages us to think further and never lose our sense of amazement. For readers of Bill Bryson and Yuval Harari.